How many times can you reboot? I guess as many as you'd like. I am not sure that it's always necessary to feel like it has to be quite that drastic. That's the cool thing about living as long as we do. We can reboot and choose a whole new career. We can warm boot and just change the place we do it. Or we can simply add new features to what we're doing. We are all programmers and the system with the biggest impact on our enjoyment of life is our own. If you think it's time to review the features, processes, and outputs of your life, know for certain that you can do it. The program that's you can be hard to change, but it is so cool to see what comes next. I hope you have all the success you can handle in 2011. You may be one of the lucky ones who've figured it all out and in 2011 you'll be running the program you've been writing. You may be someone who is making some changes. Best of luck regardless of your path. Be sure to share your stories. I'd love to hear them. 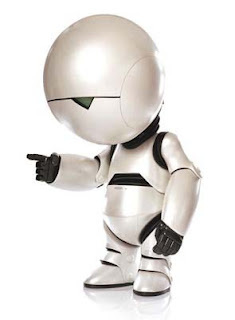 ps: Don't be a Marvin.